Rivers State Governor, Nyesom Ezenwo Wike has stated that Nigerians will resist any attempt to deliberately truncate the nation's democracy, especially with the general elections a few days away. 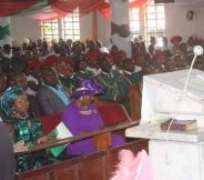 Speaking during the inter-denominational service to mark this year's Armed Forces Remembrance Day, Governor Wike alleged that there are illegal actions pointing to an undemocratic end to the polls in February. Governor Wike said that charges “concocted” by the Federal Government against the Chief Justice of Nigeria (CJN) are aimed at “frightening the Judiciary, ahead of the planned manipulation of the polls”. The governor noted that the “concocted charges” against the Chief Justice Of Nigeria are targeted at the Niger Delta. He said: “Since 1960 when Nigeria gained independence, for the first time in 2011, a Niger Delta person became the President. The entire country ganged up against him . They gave excuses and denied us a second term. We did not fight. We did not shed blood. He said his ambition was not worth the blood of any Nigerian and they called him a weak man. “Now, because they believe that the Niger Delta is not part of this country, they have come again with all kinds of stories. They think they are talking to small children. Fabricated stories and said he did not declare his assets in 2011. Step aside for who take over. We must know whether or not we belong to this country. Enough is enough. I have never seen people who are so desperate to cling to power”. The governor added: “When they came before to attack the judiciary, I raised alarm. I told them what they were doing is part of their future plan. Unfortunately, NBA did not realise it. They chickened out and gave out their judges. Not knowing that the lion is still waiting somewhere to complete the assignment. “They have INEC and the security agencies. They have plotted how to rig the elections. But they have not been able to gag the judiciary. “In order for them to consolidate in their rigging machinery, they want to gag the judiciary. The only that they want to do is to intimidate the judiciary”. “They know and the law is clear. You cannot try any judge except the National Judicial Council approves. They know they cannot try the CJN. But all they are doing is to cause embarrassment. Put fear in all the judges. Governor Wike said the “extreme manipulation of the system and the enthronement of a culture of impunity will not augur well for the country”. He said: “Nigeria will resist any attempt to truncate this democracy”. “If they lose, they will prefer something funny to happen. Anybody that does that will face the consequences. Now they are pushing people to the wall. Be careful how you deny people their mandate. Allow people's votes to count. “We are no longer in a democracy. This system is worse than the military. Even under the military, opinions of the people count”. On Rivers State, Governor Wike said any security personnel plotting evil against the state will face God's judgment and punishment.